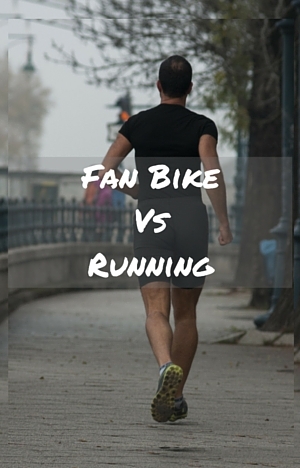 Fan Bike vs Running – How Do They Match Up? In this comparison of two great cardio training methods fan bike vs running they go one on one to see how they measure up against each other. With this comparison of running and fan bike some of the points I make below may seem too obvious (and you are probably right) but I’ve included them just to give the full picture between them. If you’re not interested in them please skip over to the points that are important to you. Aside from the bike there is little equipment required for training on an fan bike. For the fan bike you can train without regard to a console but it does make it difficult to assess speed, RPM and distance for keeping on track during training and keeping a track of performance over workouts and time. With running you probably want at least good running shoes (and maybe several looking at what people post on facebook!). Much of this is to absorb the impact and protect the foot from being damaged. You may also want a running watch like a Garmin to keep a track of your running. It probably goes without saying that the fan bike is a lower impact solution than running. When you are sitting on the seat the impact is greatly reduced as much of your weight is supported by the seat rather than your legs. If you get out of the saddle and stand on the pedals then there is more impact on the joints although there is still less than you get with running. But to keep that at a minimum on the air bike it is important to have a round motion on the pedaling motion and not an up/down stroke that can happen where you push down strongly (it happens when sitting too, but there is less weight behind each stroke therefore less at the bottom) like you would on a stepper you can get a jarring of the leg at the bottom of the stroke. The risk of impact injury is going to be more when running than on a bike as you are “jumping” one footed off the ground and then “landing” again. Form is important here to reduce the impact on the knee especially but can effect most joints in your body which can only be partly offset by good shoes (form is more important to cushion the blow). It is strange that you would think running is a more natural movement than riding an indoor bike but it seems many people don’t run “properly” putting more stress on their body and exposing them to a higher risk of damage than they should be. Good form on a fan bike with full leg motion (slight bend of knee when extended) helps to prevent strains and damage it is just that there is less stress on each stroke than there is per stride when running. This is obvious too. You do your running outside on the road, trail or a track whereas you are indoors at home or in the gym when on the air bike. It does make the bike an all weather way to get cardio whereas running can be dependent on the weather, although people do run in all types of weather it just gets to be less running training and more mental toughness training to get the session completed in some conditions. That can be satisfying in its own right. This is possibly the most important and also the hardest to compare and contrast. What you can actually burn depends on your fitness level, your weight and how fast you run. With that caveat here are some numbers to give you a chance to compare. Calorie lab have a calculator that can be used to tailor this for your own weight and level of effort (using RPE – rate of perceived effort), so if you weighed 170 lbs and at 80% RPE for 1 hour you’d burn 682 calories, running at 10 minute miles for an hour you’d burn 698 calories. Over at the CrossFit discussion board they have come up with a comparison for 400 m interval training where 400 m in 1 minute of running is the equivalent of 45 – 60 seconds on the air bike at RPM of 160 when standing on the pedals. As to getting equivalents for other distances at a slower pace it is matter of trial and error but this gives a good indication of what is involved. High intensity training is going to burn more calories than steady state running. If you are running at 10 minute mile pace you are burning on average 10 calories a minute, which is fine if it is favorite type of training. A 6 minute mile time burns 129 calories if you weigh 170 lbs. The style of training that is going to give you the best results for your health is going to depend really on which one you will do more of and you feel you get the most benefit from (and that includes mentally as well as physically). I like both these methods of training and they can work together for Cross Training to get the most out of your training and reduce risk of repetitive injuries. Training on an air bike benefits you but you do need to run if you have races in mind as it doesn’t give you the ability to cope with the stress when it comes to the race. These are 2 great forms of cardio exercise that can be used to increase your cardio fitness and burn calories with the Air bike providing a lower impact form of exercise. But which is better depends on your own preferences and what you are hoping to achieve with it. The best one is the one that you do and do consistently. The Airdyne (the name synonymous with fan bikes) is less likely to injure you but many people won’t enjoy it at all (hence the misery machine nickname) and works great for interval training, not so much for long distances (like running). P.S. The fan bike is ideal for sprints conditioning and it can certainly humble you in a quick time. If you are interested in an fan bike check out our line by line comparison to find the right bike for you.